Palestinians: is "keeping the lid on" a strategy? One of the most irritating things about this discussion is the assumption that violence is the strategy of choice for Palestinians. But, the situation is getting worse and worse. Continue reading Palestinians: is "keeping the lid on" a strategy? Posted on 27 February 2013 Author Marian HoukCategories Human Rights, Israel, Palestine & PalestiniansTags Israel, occupation, Palestinians, Third IntifadaLeave a comment on Palestinians: is "keeping the lid on" a strategy? March 30 protests [in East Jerusalem, the West Bank, Gaza, as well as inside Israel and just outside its northern and eastern perimeters] marked the start of Year Two of Popular Protests against … continued Israeli occupation. It was, this year, a combination of the Global March to Jerusalem + Land Day. The day started out slowly — but with prior Israeli preparation that had some of the trappings of the pre-Mavi Marmara “naval incident” during which an Israeli naval boarding on the high seas in the eastern Mediterranean resulted in the deaths of nine Turkish men, including a Turkish-American high school students. As the day went on, it became clear that (1) the Ramallah-based Palestinian Authority in the West Bank was ineptly and covertly trying to keep a lid on things there while allowing a low-level flame to burn; that (2) Hamas was making attempts at preventing protesters from actually succeeding in entering the Erez Terminal between Israel and northern Gaza [DEBKAfile reported, sensationally as always, that Hamas took on Islamic Jihad “snipers” to do so]; that (3) Lebanese authorities kept their rumored word not to allow protests south of the Litani River; that (4) the current Syrian Government had no interest in seeing a repeat of last year’s Nakba + Naksa Day fatalities across the UN-monitored demilitarized zone on the Golan Heights; and that government was able to allow some 15,000 Palestinian refugees and their supporters to meet and gather within a few kilometers of the border with Israel without any cross-border clashes. UN Blue Helmet truce monitors kept watch with binoculars all day where last year over 20 people died as they defined warning shots and ran through minefields — this year, the UN observers saw, maybe, a couple of butterflies. A report from CNN’s Ben Wedeman on a rally at Beaufort Castle in Lebanon can be viewed here. In preparation for the demonstrations, the IDF ordered a complete closure of the West Bank until midnight. Around Jerusalem itself, the activities [and clashes] were in the Old City of East Jerusalem [Damascus Gate in particular], at Qalandia Checkpoint between Jerusalem and Ramallah, and at the main Israeli checkpoint into Bethlehem. Bronner noted in his NYTimes piece that “While the events on Friday were less violent and smaller than many anticipated, the tenor of the discourse offered Israel little comfort”. Photo Tweeted by @DidiRemez and also published by Ma’an News Agency, in an album posted here. At Qalandiya, where there are thousands of civilians living in homes in close proximity to the checkpoint and to the action, tires were burned, the IDF moved 100 meters or so out of the checkpoint fanning north, west, and east, and there were enormous quantities of tear gas used [which fills the rooms of the neighboring houses and shops], as well as rubber bullets, skunk spray, and something used during the boarding of the Mavi Marmara [a projectile which emits smoke when fired and which causes painful welts on the skin]. There was also a problem at Qalandiya during which Mubadara Leader Mustafa Barghouthi was injured — apparently in the midst of a tear gas volley — by fighting about tactics and timing, involving his supporters and those of other Palestinian factions. Barghouthi, an elected representative to the dormant Palestinian Legislative Council who has run as an independent candidate for President of the PA, also runs the Palestinian Medical Relief Committee whose ambulances were in constant service during the day. On Friday, @jstthtgood sent these Tweets: “Mustafa Barghouti Attacked in #Qalandia while in an Ambulance because he started the ‘March to Jerusalem’ without other factions present” … and “They were suppose to wait till after prayers, and also for other ‘leaders’ to arrive” as well as “Barghouti started early and alone”. UPDATE: Ma’an News Agency is reporting on Saturday here that “Palestinian Authority investigators have visited the lawmaker in a Ramallah hospital to check up on the circumstances surrounding the injury, a police report said”. This report also notes that “The police investigation is centered on reports that Barghouti was attacked by political adversaries following a dispute about how to carry out the demonstration, which was attended by several factions”. The NYTimes piece by Bronner reported earlier that “At the Qalandiya checkpoint between the West Bank and Jerusalem, masked youths threw stones at Israeli troops and set tires on fire. The troops responded with rubber bullets and tear gas. Mustafa Barghouti, a doctor and Palestinian politician, said one of the tear-gas canisters hit him, sending him to the hospital. ‘I was hit with a tear-gas bomb on the side of my head and my back’, Dr. Barghouti said in a telephone interview from his hospital bed. ‘My scalp is injured, my right ear has problems, and they are checking to see if I have any spinal injury’. The Israeli military spokesman’s office, in a set of Twitter messages and later over the telephone, said Dr. Barghouti had not been hit by an Israeli canister but had been attacked by other Palestinians. A few Palestinian witnesses offered a similar account. The Palestinian minister of social welfare, Majida al-Masri, was treated after collapsing from tear-gas inhalation“. UPDATE: A collection of wonderfully graphic photos of the day’s activities was posted later by the Denver Post here. Bethlehem activist Mazin Qumsiyeh, who has an email list of some 50,000 names, sent out an email summary at the end of the day which concluded with the words: “Action is the best antidote to despair”. Amira Hass has written this, or things like this, in Haaretz before. It isn’t that this time she finally got it right — no, there’s still so many things to write, so many more ways to try to describe this reality so that it’s understandable, and comprehended by those not physically here [or, by those who are here, but don’t see it, or who ignore it]. But, this time [as many times], the words resonate in a special way. Amira writes: Palestinians are heroes, braving Israeli dictatorship – “To live this way and remain sane – that’s heroism. ‘And who says we’re sane?’ Palestinians answer me. Well, here’s the proof: self-irony. The thugs of the hills are only the icing on the cake. Most of the work is being done by thugs wearing kid gloves… Latest update 01:41 21.12.11, here. What do Palestinians want, if not a State? It is disconcerting and surprising to hear so many thoughtful Palestinians express doubt and anger about the prospect, maybe, of finally having a state of their own. 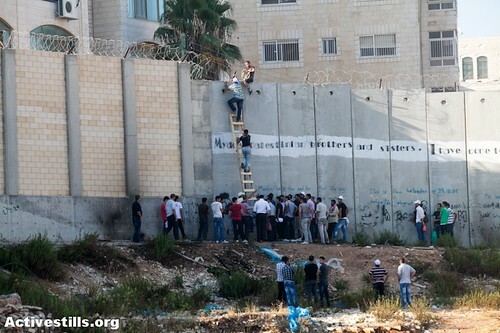 Continue reading What do Palestinians want, if not a State? Posted on 17 July 2011 Author Marian HoukCategories Boundaries & Borders, Israel, Palestine & PalestiniansTags Palestinian state, PalestiniansLeave a comment on What do Palestinians want, if not a State? AFP has written a story from UNHQ/NY, based on an as-yet-unpublished UN report, that apparently says that Palestinian and Syrian demonstrators coming from Syria crossed an “unmarked minefield” in the Golan Heights on May 15 — the day that Israeli forces were surprised by the breach. From the AFP story, published here, it is not clear if this referred to a field of Israeli, or Syrian, mines. The AFP story, published yesterday [Wednesday June 15] says that “On May 15, about 4,000 mainly Palestinian demonstrators gathered on the Golan Heights on the anniversary of Israel’s 1948 creation. The UN report said about 300 moved toward the Israeli side ‘and despite the presence of the Syrian police, crossed the ceasefire line, through an unmarked minefield‘ and broke through an Israeli security fence. Israeli forces at first fired tear gas, then warning shots and then used ‘direct fire’, according to the UN, which said four dead and 41 wounded were reported. On June 5, Palestinians again gathered at two places on the Golan Heights ceasefire line. ‘Despite the presence of Syrian security forces, protesters attempted to breach the ceasefire line in both locations’, the UN said. Israeli forces again used tear gas and then live fire to deter the demonstrators. The UN said up to 23 people were reported killed and many more wounded … The UN report said ‘anti-government demonstrations in Syria spread to several villages’ on the Syrian side of the ceasefire line. UN observer teams have been denied access to six villages ‘ostensibly for reasons of safety and security of the military observers’, the report said”. This AFP story is published here. (1) There is a question of proper notification, both to Syrian authorities and to UN peacekeeping missions working in the Golan. (2) There is also an unanswered question about whether or not the minefields were properly marked [particularly any newly-laid minefields], in order to provide adequate warning to the demonstrators themselves. (3) The breach of the Syrian and Israeli lines by Palestinian and Syrian protesters in demonstrations both on June 5 and also on May 15 has raised questions about how the UN peacekeeping forces who operate there are working. On Monday 6 June, a day after the latest demonstrations, the Israeli media published reports that newly-laid IDF minefields were among the preparations undertaken since the Nakba Day protests on May15 (when Palestinians + Syrians surprised the IDF by crossing the Golan on foot and entering Majdal Shams etc.) These newly-laid IDF minefields were reportedly planted expressly to prevent a second breach of the lines, in anticipation of the June 5 demonstrations marking the start of the June 1967 war (and the start of the Israeli occupation). An unclear number of people, said to be unarmed, were killed by unclear causes, apparently including minefield explosions. UNDOF’s Croatian Battalion is located in the middle of the UN Zone that separates Israeli and Syrian lines near Majdal Shams. The current UNDOF deployment map is published here. The story has not yet been developed. The first indications of injuries and deaths from mine explosions came from accounts given to the Israeli media by the IDF Northern Command on June 5, and then by IDF spokespersons themselves. The IDF aid that some protesters supposedly threw Molotov cocktails onto one minefield, apparently near Quneitra, thereby setting off one or more explosions. At least one IDF spokeswoman insisted, in an interview with one of my colleagues, that this peculiar tragedy involved minefields left over from the 1967 war. UPDATE: However, the as-yet-unpublished UN report blame the fire not on Molotov cocktails supposedly thrown by demonstrators, but rather on the tear gas (or smoke?) canisters fired at the demonstrators by Israeli forces. Thanks to a tip from NYC-based journalist Alex B. Kane, who published his own account on Mondoweiss, there, we discovered a DPA [German Press Agency] story published by Haaretz on Tuesday evening, here reports that “A UN report on the Naksa day events said the IDF used tear gas, smoke grenades and live fire to prevent the demonstrators from crossing the ceasefire line. It stated: ‘Several anti-tank mines exploded due to a brush fire apparently started by tear gas or smoke grenade canisters near UNDOF facilities at Charlie Gate [near Quneitra? ], resulting in casualties among protesters’. The brush fire was put out by Syrian and Israeli fire squads, and UNDOF, the report read”. So, to satisfy the IDF standards of proof that they were only “shot in the feet”, those injured should have walked back across the lines…? Uri Avnery has written, in his weekly article, that [sarcasm alert here] “JERUSALEM IS abuzz with brilliant new ideas. The brightest minds of our political establishment are grappling with the problems created by the ongoing Arab revolution that is reshaping the landscape around us”. The Avnery article continues: “Minister of Defense Ehud Barak has announced that he is going to ask the US for a grant of another 20 billion dollars for more state-of-the-art fighter planes, missile boats, a submarine, troop carriers and so on. Prime Minister Binyamin Netanyahu had his picture taken surrounded by female soldiers – like Muammar Qaddafi in the good old days – looking beyond the Jordan River and announcing that the Israeli army would never ever leave the Jordan valley. According to him, this occupied strip of land is Israel’s vital ‘security border’. This slogan is as old as the occupation itself. It was part of the celebrated Allon Plan, which was designed to surround the West Bank with Israeli territory. Incidentally, the father of the plan, Yigal Allon, was also a leader of the Kibbutz movement, and the Jordan valley looked to him like an ideal area for new Kibbutzim – it is flat, well watered and was sparsely populated. However, times have changed. When Allon was a legendary commander in the 1948 war, he did not even dream of missiles. Today, missiles launched from beyond the Jordan can easily reach my home in Tel Aviv. When Netanyahu declares that we need the Jordan valley in order to stop the Arabs from smuggling missiles into the West Bank, he is, well, a little bit behind the times. When the politicians bravely face the new world, the army dares not lag behind. This week, several division commanders announced that they were preparing for Tahrir-style ‘non-violent mass uprisings’ in the West Bank. Troops are trained, riot control means are stocked. Our glorious army is being prepared for yet another colonial police job … In the meantime, a dozen top politicians, from Avigdor Lieberman down, have been dusting off moribund plans for ‘interim agreements’ – old merchandise sitting sadly on the shelves, with no buyers in sight”. Can Israel build bridges to possible new “progressive, multi-party” Arab societies?, Avnery asks … and answers: “I believe we can. But the absolute, unalterable precondition is that we make peace with the Palestinian people. [Yet] It is the unshakable – and self-fulfilling – conviction of the entire Israeli establishment that this is impossible. They are quite right – as long as they are in charge, it is indeed impossible. But with another leadership, will things be different? … A peace agreement – signed by the PLO, ratified in a popular referendum, accepted by Hamas – will radically change the attitude of the Arab peoples in general towards Israel. This is not simply a matter of form – it goes deep into the bedrock of national consciousness. 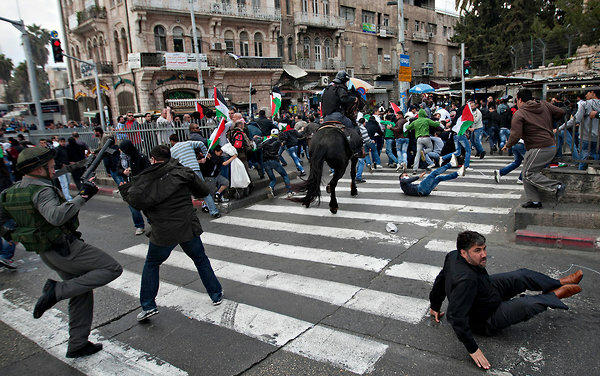 Not one of the ongoing uprisings in the various Arab countries is anti-Israeli by nature. Nowhere do the Arab masses cry out for war. Indeed, the idea of war contradicts their basic aspirations: social progress, freedom, a standard of living which allows a life in dignity. However, as long as the occupation of Palestinian territory goes on, the Arab masses will reject conciliation with Israel … Therefore, Israel will crop up in every free election campaign in the Arab countries, and every party will feel obliged to condemn Israel. ONE ARGUMENT against peace, endlessly repeated by our official propaganda, is that Hamas will never accept it. The specter of Islamist movements in other countries winning democratic elections – as Hamas did in Palestine – is painted on the wall as a mortal danger. It may be worthwhile remembering that Hamas was effectively created by Israel in the first place. During the first decades of the occupation, the military governors forbade any kind of Palestinian political activity, even by those who were advocating peace with Israel. Activists were sent to prison. There was only one exception: Islamists. Not only was it impossible to prevent them from assembling in the mosques – the only public space left open – but the military governors were told to encourage Islamist organizations, as a counterforce to the PLO, which was considered the main enemy … On the outbreak of the first intifada, the Islamist movement constituted itself as Hamas (“Islamic Resistance Movement”) and took up the fight”. Now, Avnery asks, “Will Hamas accept peace? It has declared as much in a roundabout way: if the Palestinian Authority makes peace, they have declared, and if the peace agreement is ratified by a Palestinian referendum, Hamas will accept it as an expression of the people’s will”. This Avnery article is an interesting compliment to remarks made by former Mossad Director [he served three terms] Efraim (Ephraim) Halevy to members of the Foreign Press Association at a briefing at the Foreign Press Association last Thursday. Halevy was presenting the results of a study — entitled “Future Borders between Israel and the Palestinian Authority” — done by the Shasha Center for Strategic Studies, which he heads, at the Hebrew University of Jerusalem’s Federmann School for Public Policy and Government. Halevy — who told the journalists: “I was an intelligence officer for 48 years — noted that the study is an academic effort which will be sent to “both addresses” (Israeli and Palestinian? ), and which was conducted entirely independently of any developments within the current Israeli government (which he said at another point was “weak”), although Israeli Prime Minister Benyamin Netanyahu has announced that he plans to present, soon, some kind of “long-term” but “interim” solution. Halevy said that the study concluded that the most viable solution would be “no solution” to the Palestinian-Israeli dispute. Paradoxically, he said, the participants agreed that an “agreed-upon international border”, meaning a peace treaty (or a part of one) was not possible, though it was desirable, because “We believe that the penalty or price that would be paid for keeping a no-solution situation is so high and so prohibitive … that both sides would prefer any other solution”. For the Palestinians, he said, “saying that after all these efforts there is no solution, might well mean the end of existence of the Palestinian Authority (PA)”. And, he added, “even if a Palestinian State is declared, but it’s not operative, this would be political bankruptcy”. “Israel can live longer with no solution”, Halevy said, “but the penalty the Palestinians will pay is much greater … They can’t live with no solution … and for us [Israel], the existence of the PA is a major interest”. What is needed is not an “end of conflict” (a term used by previous Israeli governments from Ehud Barak to Ehud Olmert), Halevy noted, but rather an “agreement on co-existence”. While the initial reaction might be, “Oh no, we don’t want this”, Halevy said, “at the end of the day, if you have to choose between bad and worse”, this might be the better option. This would be better, he said, because [a] the time frame would be less, therefore the chances for implementation would be greater (“you cannot make a commitment for somebody else in the future to implement”); and also because [b] the opposition is much less on both sides, because “we wouldn’t be signing off in the end of the conflict, and in Israel we’ll continue to live the kind of live we have today — in terms of economy, education, and style of life”. For the Palestinians, he said, such an agreement on co-existence would also have a virtue: “maybe we really don’t want a referendum because we can’t guarantee the results”, while for Hamas in particular, he said, “they have been asking for a while for a temporary solution, and they, as spoilers, would give the Palestinians the necessary consensus” to support this “agreement on co-existence”. Halevy said, in answer to a journalist’s question, that yes, he did see such an agreement as a step along the way to a permanent solution and not an end in itself, as the Palestinians fear it would be. He added that ultimately borders would not have the same significance that they have today – but, he said “it will take generations, and much education”. In any ase, he said there is now “growing unrest in the West Bank — in terms of conflict between Jewish and Arab populations — and a whole list of possible developments that could be negative for Palestinians in the West Bank that would make the whole solution fall apart, and would cause the loss of the benefits if sitting around in cafés in Ramallah and Nablus”. However, he said, he saw “no great appetite to go back to [Intifada-style] violence in the West Bank”. He noted that he had recently written in Yediot Ahronot that “Israel is a threat-prone society … but fear is not a policy”. And, he said, “we’ll know in a couple of weeks what the consequences will be in the West Bank and Gaza” of the uprisings in Tunisia, Egypt, Libya, and elsewhere. “I do not feel there will be a copy-cat phenomenon”, but “I do feel there are pressures on the PA to do something, and to do it quick”. The result of the uprisings, he said, is that “the timetable is much shorter now, and if by September nothing happens, it’s too late”. He indicated later that he was referring to the end-date of Palestinian Prime Minister Salam Fayyad’s two year program for the establishment of institutions of a Palestinian State (not, he said, to the possible, or probable, moves in the UN Security Council and UN General Assembly to secure full UN membership for such a Palestinian State). He said, however, that he didn’t think it’s going to happen, but he did say that by the end of the year we’ll be in a new situation”. “We don’t have time to mess around”, Halevy added, because the net result is that the uprisings in North Africa have “accelerated the pace of events”. It was earlier predicted that 2011 would be critical, Halevy said, and “I think yes, 2011 is a critical year”.